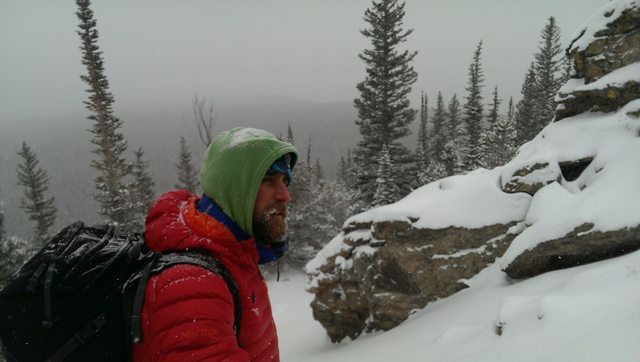 During the last weekend of 2014, I took the AIARE Level 1 Avalanche Course through Colorado Mountain School (CMS). I took it because, more and more, I’m becoming aware of the fact that safe ski slopes don’t just happen. There’s an enormous amount of science, engineering, and intuition – not to mention just plain hard work – that ski patrol puts into keeping skiers safe on the mountain. The more I ski “extreme” terrain at the resorts, the less comfortable I am with my own ignorance about the process. I also took the course because I want to understand more about the risks I might be accepting in the backcountry, and how to mitigate them. I’ve owned the equipment – beacon, shovel, probe, and skis with AT bindings and skins – for several years, but I have skied in the backcountry only rarely. Actually, only once outside of a class. I didn’t have the knowledge to evaluate avalanche terrain; then again, I didn’t want to have to blindly trust in my friends’ judgment. I also had the general impression that in Colorado, snowpack is so fickle that anything safe to ski would be either relatively boring (low angle) or relatively unpleasant (wind-scoured or sun-baked). The course spanned three days, each consisting of some classroom time and some field work. Because of the extremely cold weather, we may have spent more time in the classroom than another class would – in particular, the last day had more classroom time than planned. I don’t think anyone minded – the cold was brutal. On the flip side, we were also blessed with plenty of fresh snow, allowing us to observe changing Colorado Avalanche Information Center (CAIC) bulletins – and allowing us to play in the powder. Before this class, I had a fair amount of previous exposure to snow safety information. I attended a free REI seminar on beacon usage; I took the Intro to Backcountry day trip through CMS; I’d read Staying Alive in Avalanche Terrain and Snow Sense; and just the weekend prior, I’d attended the Copper S.A.F.E. A.S. women’s snow safety clinic, which was an intense day of classroom and snow time, focused on avoiding human factors and practicing rescue scenarios. Our class had 24 students and four guides. We did the classroom portion as a large group, then broke into smaller groups for the field work. This gave us an opportunity to work closely with three different guides. On day one, we learned about the types of avalanches, the conditions for their creation, and their indicators. We then went to the entrance of Hidden Valley in Rocky Mountain National Park (RMNP) to learn about our beacons and practice with them. On day two, we learned how to read the daily CAIC avalanche bulletin (there’s a lot of information packed into that site!) and how to fill out a Field Book to create a trip plan based on the bulletin, as well as recording our own observations. We dug a snow pit somewhere near Bear Lake. I struggled with kick turns; then I struggled trying to ski down through trees and powder on my skins, and intentionally fell rather than risking a run-in with a tree. It was not my day to shine. Day three is also when I found out that skiing supposedly low-angle terrain can still be exciting and challenging. While I’d heard people say that they enjoyed meadow skipping, I pictured practically flat expanses of powder, where you’d be poling as much as you’d be sliding. Pretty, but not exactly fun skiing. 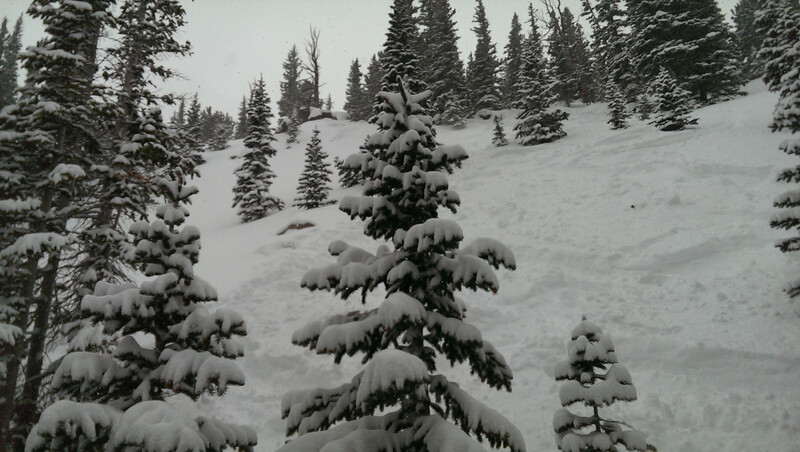 Or I pictured the day I’d skied Banana Bowl – not only low-angle, but also wind-affected, nasty slab snow. So while I was interested in learning about avalanche danger, I suspected it would confirm my own expectations – that I wouldn’t be going into the backcountry much, and that if I did so, it would be purely for the social or fitness aspects, not for the fun skiing. After all, fun skiing was dangerous, and safe skiing was boring. That’s what I thought. That was all before day three. On day three, our group discussed our objectives, which ranged from getting some sweet turns, to getting some experience with skinning, to studying the snowpack more, to getting more beacon practice. Our guide suggested a route that would allow us to do a little bit of all of that. So there we were. We skinned up a well-traveled trail for a while; then we departed from the beaten path, our guide breaking trail in gradual switchbacks. It thus came to my attention that there can be more to snow country travel than following signs and established routes. Of course, following someone who already knows the area intimately is a great way to head straight to the goods. The day might not have gone so smoothly (understatement!) if we’d been puzzling out the route on our own. We were soon at the top of a lovely pitch of untracked snow and majestic trees. In fact. Hm. It looked kind of steep and tight, especially after being warned that rocks lurked just beneath the surface, and being told to ski extremely conservatively – “On a scale of one to ten, with one being pizza – ski at a two or a three.” “How steep did you say this slope is?” “Twenty-eight degrees.” Huh. It seemed plenty steep to me. And I always struggle with the switch from skins and loose heels to slick skis and locked heels. What on earth had made me think I needed to be on a 38 degree slope to make a backcountry excursion worthwhile? So, we skied the short pitch. And in two or three turns, I fell in love. I made maybe one decent turn; the other two were frankly pretty ugly, and rocks left their marks on my bases. But the snow. The beauty. The thought that we were probably the first people to ski this particular run this season. The realization that backcountry skiing could be both magical and safe, and that I had the tools now to choose these sorts of slopes myself. Intoxicating. My only complaint about the class is a feature, not a bug – they don’t go into how snow pits and other observations get translated into specific advisories. The curriculum sticks to generalities, not particulars. Students are not given the tools to make their own snow predictions; that’s not the point. My husband and I, out of sheer enthusiasm and our innate need to know how everything works, kept asking questions that were far more detailed than the class structure allowed. So I’m pretty sure that in a year or two, I’m going to take Avy 2. Not so much because I want to be making those predictions myself, but because I want to understand what goes into those predictions. My quest for knowledge continues. Sounds like a great experience. I love your discussion on how our perceptions are one thing, and reality is often another. The human factor discussion is more prevalent now than it was a decade ago. However, there should still be room for the technical snow-pit data discussion as well. Sounds like your instructors struck a good balance. Thanks, Kim! I thought the class was great. My brain was full and I had plenty of stoke – what could be better?